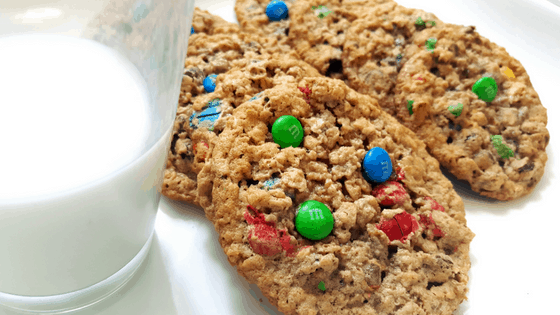 This Monster Cookies recipe has been handed down many generations in my family. It was a favorite in my childhood during the Holidays and now a favorite of my own children as well. This cookie is easy to make and delicious to eat and makes a large batch so you will have plenty to share. This recipe comes together very easily with very simple ingredients. These are incredibly easy to mix, you don’t need a mixer. You can do it by spoon or by hand. If you do make this recipe by hand -the trick is to make wide swipes in the bowl to thoroughly mix the ingredients. You simply sprinkle and stir in the chocolate chips and M&M’s so you don’t over mix and break the pieces. They come out perfectly round in shape if you use a cookie scoop. It’s a great way to keep your cookies consistent, especially important if giving as gifts. Turn these cookies into gift by making cookie gift jars! This Monster Cookie recipe has been handed down many generations in my family. It was a favorite in my childhood during the Holidays and now a favorite of my own children as well. This cookie is easy to make and delicious to eat and makes a large batch so you will have plenty to share. Combine softened butter, peanut butter, vanilla, and eggs in mixing bowl and beat until creamy. I use my Kitchenaid Mixer. Slowly add dry mixture to mixing bowl and stir on low. Adding a little at a time, mix in chocolate chips. Scoop cookie mixture onto ungreased cookie sheets. I use a cookie scoop to get the same size cookies. Bake for 11 to 13 minutes, let cool. Let cookies cool completely and store in air tight container. These look so good! We will have to try some soon! These look delicious to make with my little boy!!! I love the name and how easy they seem to be to make. I am NOT a baker more of a cook. But these look simple enough!